While I rather enjoy extravagant looks and high heels in my time off, work wear is usually a bit more toned down as comfort is key for me there. So this is the start of a little work wear series. Even now in winter I prefer simple cotton jersey tees or tops as they are the most breathable and convenient. I take a bike to the office every day so being able to move freely is a must. I’m also a big fan of layering so cardigans and scarves are a must for me. I usually start getting cold soon after sitting down at the computer. This pixel Meerkat T-shirt by ArmedAngels is one of my favourites and I love combining it with a warmer layer such as this doubleface sweat cardigan by Tom Tailor. The ostrich embossed Furla bag adds a bit of visual interest and a pop of colour. 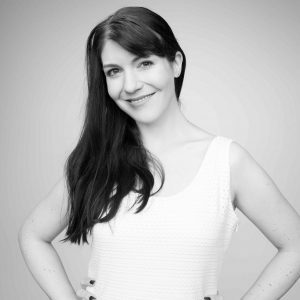 I have to admit I resort heavily to black and white combinations in my work wear as those are just so versatile and can be dressed up or down accordingly. 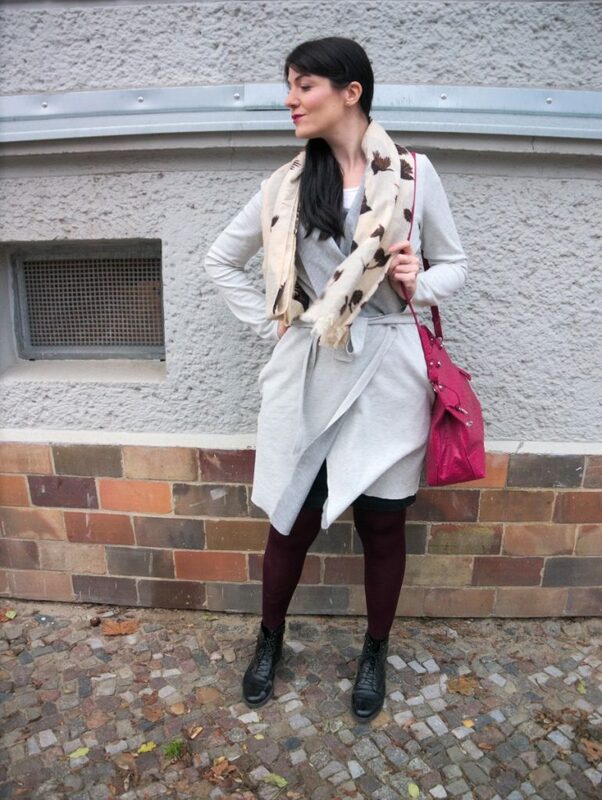 Ich finde die Arbeits- und Alltags-Outfits anderer Blogger immer sehr spannend. 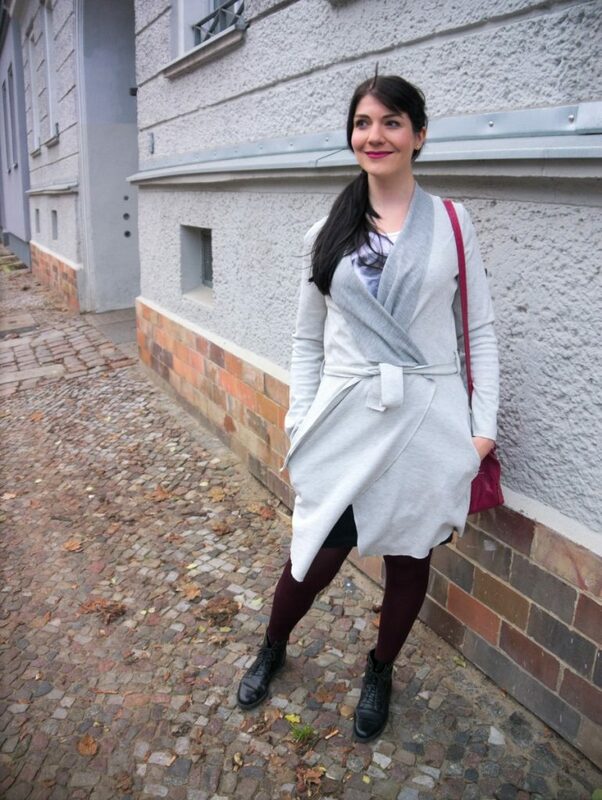 Denn obwohl ich als Fashionbloggerin natürlich gerne mal über die Stränge schlage und mich im Tüllrock und High Heels zeige, sehen meine Büro-Looks dann doch anders aus. Denn an Arbeitstagen habe ich es gern bequem und praktisch. Trotzdem sollen meine Outfits natürlich ein bischen chic sein oder zumindest meinen persönlichen Stil unterstreichen. Da ich mit dem Fahrrad zur Arbeit fahre, trage ich sehr gern Tops und T-Shirts aus Baumwolljersey – auch jetzt im Winter, da man sich in ihnen einfach am besten bewegen kann. Weiß ist dabei mein absoluter Favorit, da ich denke, dass es zu meinem typ am Besten passt. Außerdem bin ich ein großer Freund von Layering-Looks da mir auf dem Fahrrad eher zu warm, im Office dann aber auch schnell wieder kalt wird, sobald ich am Rechner sitze. Auch Schals gehören für mich immer dazu, da ich eine kleine Frostbeule bin. Hier ist mir Qualität sehr wichtig, denn ein Schal aus einer Kaschmir-Seide-Mischung ist viel angenehmer zur Haut als ein Stück aus reinem Polyacryl. Und hält auch viel besser warm! Wie sehen eure typischen Arbeits-Outfits im Winter aus? Do you have a winter uniform? Hey, ein tolles Outfit. Nur im Shirt wäre mir auch auf der Arbeit zu kühl, aber der Cardigan sieht dazu super aus! Hi Christina! 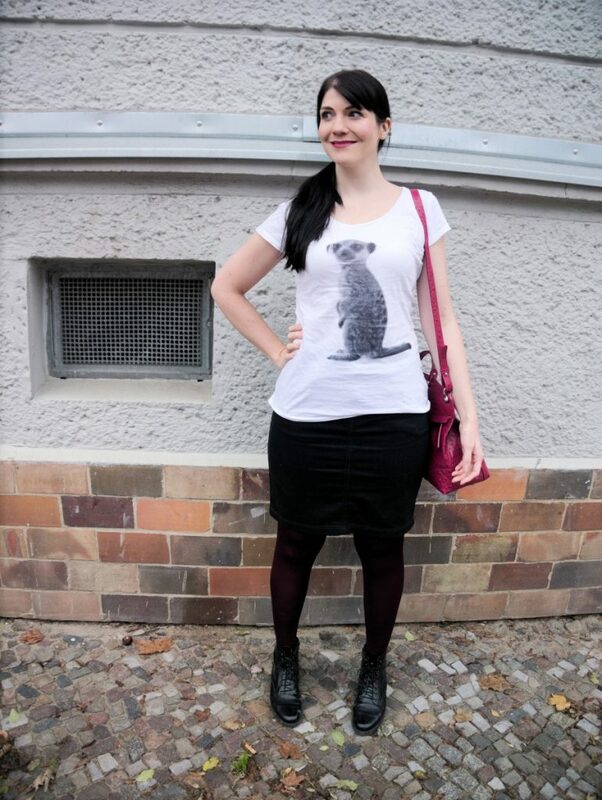 You look lovely in this outfit, and I adore the meerkat print top! It’s so whimsical and fun, and adds a playful touch to the look. I agree, comfort is key at work, but you’ve managed to look stylish and ultra-chic at the same time. I work part time in retail now and thankfully, I have a certain dress code to follow so I don’t have the headache on what to wear for work. LOL! Love this look for work! Your tee is so fun! This t-shirt is so cute! And how gorgeous your bag is!!! This looks like a great work look, and I adore that coat! 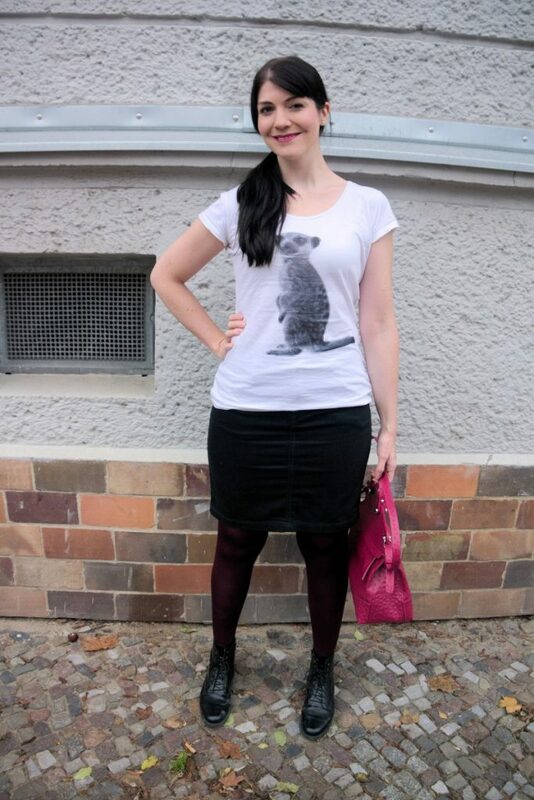 Very nice Outfit, liebe Grüße, Lena! Dein Outfit mit dem Mantel darüber finde ich super!!! 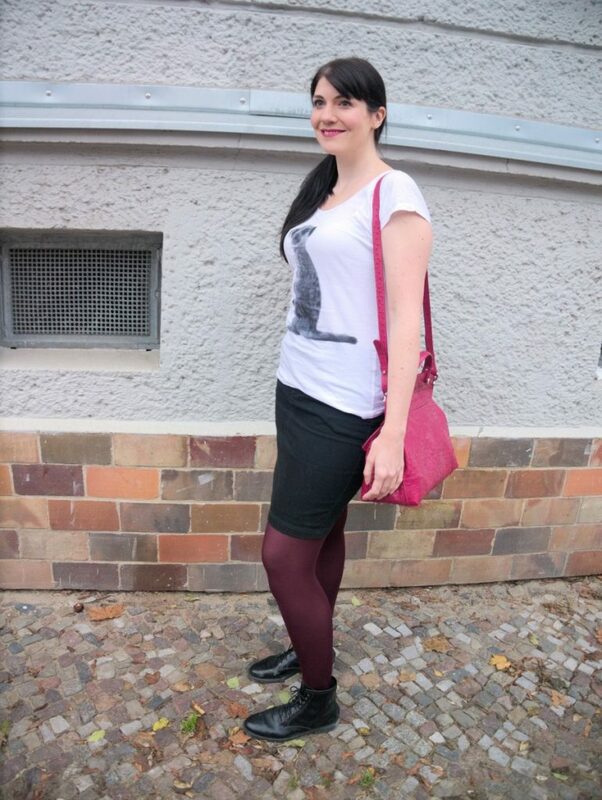 Und wieder einmal trägst du eine Strumpfhose nach meinem Geschmack – echt tolle Farbe!!! This is such a cute and stylish work outfit! 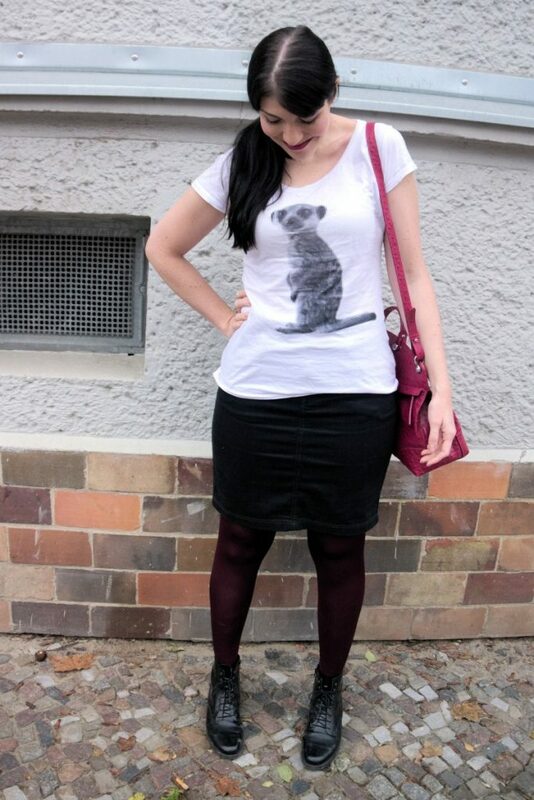 That tee is adorable and I love how you’ve added those plum tights. I think it’s great that you ride your bike to work, it’s a great way to get in some exercise and a much cheaper way to commute! Thanks for sharing and I hope you have a wonderful week ahead! I love your top. Great work look. I tone it way down for work too. That T-shirt is so pretty. 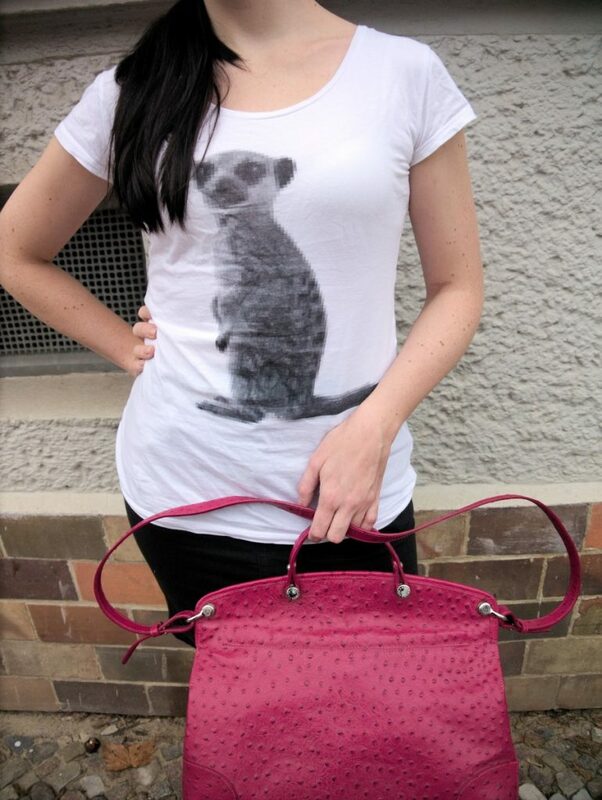 I love that shirt so much, the meerkat is so cute! Work wear can be really tricky. I also try to focus on comfort in my work attire so I definitely appreciate this look! Your t-shirt is super cute and I LOVE your grey coat! Great office attire!! Da bin ich gerade am Ausprobieren. Ich hab gerade einen neuen Job angefangen, einen Officejob. Da das mein erster solcher Job ist, habe ich nicht all zu viele Kleider dafür und muss langsam sehen, dass ich mir ein paar Teile zulege. Layering is key in offices. They are always too hot or too cold so a cardigan, light sweater, or jackets are a must have. I like hoe you added a bit of your personality with the tee. Love this stylish work outfit! Your top is so cute! Layering is really everything in Winter. How cool that you take a bike ride to the office! I’m sure that’s a very healthy habit and you’re also helping the ecology. That t-shirt is so lovely. I sometimes wear cotton t-shirts under jumpers and sweaters because as you said- they let the skin breathe. Naturally, I also love to pair them with cardigans and cute jackets- to make them more visible. you look great! fabulous skirt too.